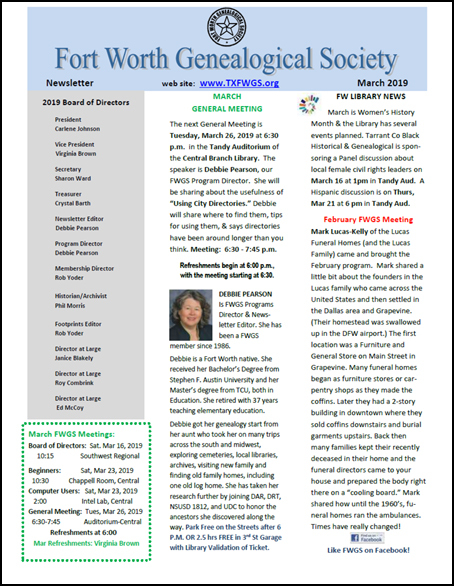 The Fort Worth Genealogical Society publishes a newsletter once each month, except December. The contents generally include Society news plus area meeting notices. For publication consideration, the deadline for submissions is the first day of the month. Our Newsletter is now snail-mailed only to members who do not have internet access. A digital copy of our Newsletter is emailed to all other members and guests who are subscribed to our Mailing List. Newsletters are then posted on our website as a free download. You are also invited to join our Mailing List at no charge to receive our newsletters and local meeting notices. These documents require Adobe Reader. This is a free download. it seems that Debbie is bucking the trend. It's about time.